I’ve been dreaming about New York City recently…yes, I do miss, and I don’t. I think of the times when it has been idyllic, the glorious views, the excitement, but then…I gotta remind myself of why I left. Anyway, in the spirit of remembering what’s good about New York, if you can ignore the stampedes of harried Christmas shoppers, the crowded, cold, drafty subways, the dirty slush….enough already! It was beautiful in many ways. The trees, the holiday store windows, the lights and all, and one of my favorite memories, was the Angel Tree at the Metropolitan Museum of Art. Despite customers who demanded customer service that was beyond human capabilities, I did get some perks. 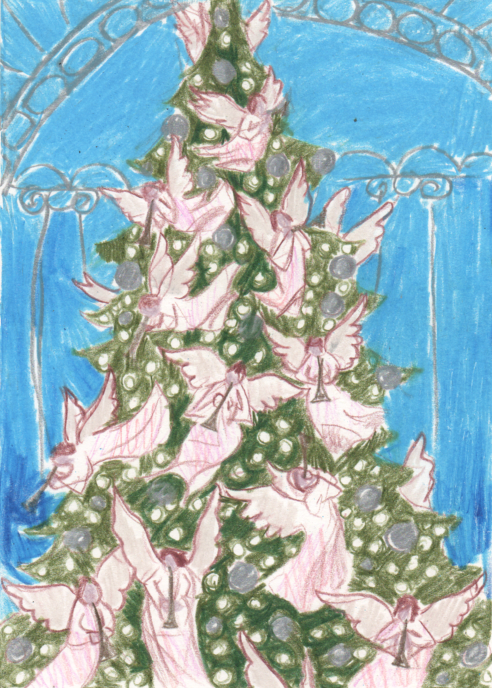 At Christmas time, in the medieval section they put up the tree decorated with angels. Looking at it, I got the old feeling that I hadn’t experienced since I was about 9 years old…that of the magic of a Christmas tree. So, my impression, on my latest card…done from memory, not true to life. If I had taken a reference photo and drawn it, well, that would be art based on other art, based on other art. I felt funny about that.